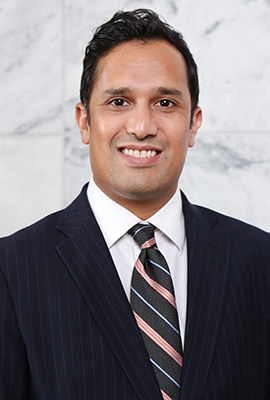 Dr. Fazal Khan joined Georgia Law in the fall of 2006. Specializing in health law, Khan teaches Health Law & Policy, Bioethics, Public Health Law and International Products Liability. His current research focuses on several major themes: reform of the American health care system, the effect of globalization on health care and the challenge of regulating emerging biotechnologies. Representative articles and presentations include proposals on: administrative regulations to protect against epigenetic harms (and endocrine disruptors) in consumer products; ethical regulations on human drug trials in developing countries; rethinking public health laws post-9/11 to ensure adequate protection of civil liberties and effective emergency response; the potential dissonance between personal health records and electronic medical records; and ethical safeguards that would allow organ donation from anencephalic infants. Recent publications include "Preserving Human Potential As Freedom: A Framework For Regulating Epigenetic Harms" (Health Matrix, 2010) and "Ensuring Government Accountability During Public Health Emergencies" (Harvard Law and Policy Review, 2010). Khan has considerable experience in both legal and medical fields and has been interviewed and called on as an expert by both television and print media on topics ranging from national health care reform and end of life legal issues to public health legal policies. He earned his bachelor's degree from the University of Chicago and his medical and legal degrees from the Medical Scholars Program at the University of Illinois at Urbana-Champaign. The 'Uberization' of Healthcare: The Forthcoming Legal Storm over Mobile Health Technology's Impact on the Medical Profession, 26 Health Matrix: The Journal of Law-Medicine 123 (2016). Genomics Unbound: the Bright Future of Genetic Testing and Therapy in Light of Prometheus, 13 Nev. L. J. 668 (2013) (with L. Kessler). Gene Patents No More? Deciphering the Meaning of Prometheus, 2 Annals Health L.: Informed Consent 19 (2012) (with L. Kessler). The Legal Challenge of Incorporating Artificial Intelligence into Medical Practice, 6 J. Health & Life Sci. L. 90 (2012) (with A. Swanson). Verify, Then Trust: How to Legalize Off-Label Marketing by Drug Companies, 117 Penn St. L. Rev. 407 (2012) (with J. Holloway). Data Bank Information Needs Careful Interpretation, 55 American Medical News 23 (2012). Preserving Human Potential as Freedom: A Framework for Regulating Epigenetic Harms, 20 Health Matrix 259 (2010). Ensuring Government Accountability During Public Health Emergencies, 4 Harv. L. & Pol'y Rev. 319 (2010). Towards Achieving Lasting Healthcare Reform: Rethinking the American Social Contract, 19 Annals Health L. 73 (2010) (Special Edition). Paging King Solomon: Towards Allowing Organ Donation from Anencephalic Infants, 6 Ind. Health L. Rev. 17 (2009) (with B. Lea). The Human Factor: Globalizing Ethical Standards in Drug Trials Through Market Exclusion, 57 DePaul L. Rev. 877 (2008). International Human Rights and Clinical Drug Development, Dean Rusk Center Newsl. (Winter/Spring 2008). "Mobile Health Technology: Legal Barriers to Disruptive Innovation” in The Handbook of Research on Digital Transformations (F. Olleros and M. Zhegu, eds.) (Elgar Publishing, forthcoming 2015). "The Use of Toxicology in Tort Litigation in Ohio" in The Use of Toxicology in Tort Litigation: A Survey of Federal and State Jurisdictions, (American Bar Association, 2004). "Triple Therapy to Improve the Ethical Health of International Drug Trials," Speaker, Faculty Symposium, University of Georgia School of Public Health (March 5, 2008). "An International Scheme to Deter Unethical Biotechnology Research," Speaker, Health Law Scholars Workshop, St. Louis University Center for Health Law Studies (Sept. 8, 2007). "Corking the Genie: An International Scheme to Deter Unethical Biotechnology Research," Speaker, South Eastern Association of Law Schools (SEALS) Annual Conference (July 29, 2007).